The Sennheiser HD 600 headphones are a good choice for home listening if you're willing to pay for high-quality sound. Sennheiser's high-end open-air headphones deliver deep bass, luxuriously padded ear cups, and a replaceable cord for a more economical price than their flagship model. Expensive; not the best solution for portable listening; gray and black plastic finish doesn't scream high end. The Sennheiser HD 600’s are truly an amazing set of cans any way you dice it. They sound great with virtually anything you attach to them but reach their full potential with the best electronics unlike any other headphones I have listened too. Yup, I'll say it, one of the worlds greatest headphones. At $450, the Sennheiser HD 600 is fairly expensive for a dynamic headphone, although it's far from the costliest available. Yet it deserves to stand beside any component that inhabits Class A of Stereophile 's "Recommended Components. Here at MajorHifi, we review new and old headphones alike – whatever we can get our mits on, really. And sometimes we forget to review certain headphones because they are already established as sonic staples in the audiophile landscape. With clean and transparent mids and smooth highs,the Sennheiser HD 600s possess many of the traits for which people gravitate towardplanar and electrostatic speakers, and at a cost that's far lower. The HD600, HD650 and Q701 are in the same class of higher end sound. The rest of my headphones fall below. The next class is HD595 and ATM-500. I will say my QC15 are fantastic noise cancelling but with major quality issues of one side quiting out. Out of all the headphones I have, I find the HD600 the most enjoyable. The HD650 are at times better but overall I enjoy the HD600 the most., I have SR-60, SR-80, HD555, HD595, HD600, HD650, AKG Q701, ATM-50, Bose QC15 and some various earbuds. There is always better, but these are great headphones. I use these with my Adam A7x speakers and they're the first headphones I've bought where it doesn't sound like I'm listening to a different mix when I put my headphones on. I've got Focal, AKG and another pair of Sennheiser's, but these are the best. I do a lot of early-morning music production (when the family is still sleeping!) so I felt like I needed to invest in some quality headphones. 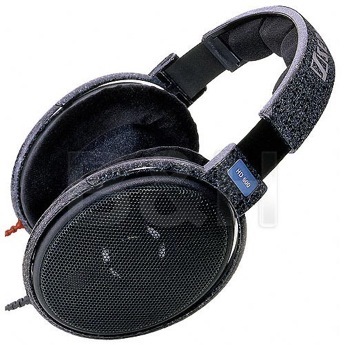 My ATH-M40fs had done fine for a while, but I wanted to see if there were better critical headphones out there. Still, $ is a good chunk of change.. I bought these yesterday as a replacement for my HD 598se and already love them. They sound excellent with my Schiit Magni Amplifier and Schiit Modi DAC. The only gripe (minor as it is) I have about them is how long the cable is, but since it is removable I really do not see it as a con. I've been wanting these for quite some time. I'm getting a bit older, OK a lot older, so I don't think the HD600s would be the R&b listeners may not care for them. They to me a smooth curve thru out the frequencies. No "booming bass". These are very good headphones for the money, quite balanced sounding. Yes there are some headphones which can do this and that better technically, but somehow not as balanced overall and not as natural in the midrange. More faithfully represents the sound than any headphones I've used so far. My favorite band is symphonic metal, so there's a lot going on in their music. I had been disappointed at the newest release, until I listened to it on these headphones. Simply stunning, have to be used with a decent dedicated headphone amp but worrh every penny. If you have to use the adapter get yourself the hd650 replacement cable because it makes a big difference in sound quality and is physically more substantial.